Every Saturday, I host a feature called Kid Konnection -- a regular weekend feature about anything related to children's books. This week I'm going to share with you two picture books that are positively adorable and have terrific messages! Summary: The Land of Unicorns is in trouble — it has been raining and raining for what seems like forever. This is a big problem because there are only three ways that unicorns can get their magic: from the golden sun, from magnificent rainbows, and from the sparkle of believing. UNI THE UNICORN AND THE DREAM COME TRUE by Amy Krouse Rosenthal and illustrated by Brigette Barrager is the followup to 2014 bestseller UNI THE UNICORN. I missed out on UNI THE UNICORN, but I'm certainly jumping on the bandwagon with this new book. It's so fun! UNI THE UNICORN AND THE DREAM COME TRUE takes place in the Land of the Unicorns where it's been raining for a very long time. Sadly, that affects how unicorns can get their magic because they can only get their magic from the sun, rainbows, and the sparkle of believing. Uni the Unicorn was a bright ray of hope because she was a true believer that little girls were real... and that means that Uni was as strong and magical as ever. However, the other unicorns were in trouble. Fortunately, a little girl was as much as a believer as Uni. When Uni and the girl combined their wishes (along with a few other unicorns), they learned that nothing is impossible! 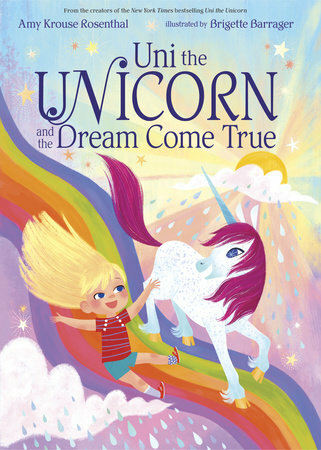 UNI THE UNICORN AND THE DREAM COME TRUE is such a terrific picture book. I love the story about Uni and this little girl who were true believers. Together, they proved that they could accomplish so much and help others. What a great message! In addition, the illustrations in this book are beautiful. They are so sweet and the perfect complement to this magical story. Since it takes place in the Land of Unicorns, you can imagine the glorious rainbow colors too. UNI THE UNICORN AND THE DREAM COME TRUE is sure to be a favorite with the fantasy, sparkles, and unicorn crowd. Highly recommended! 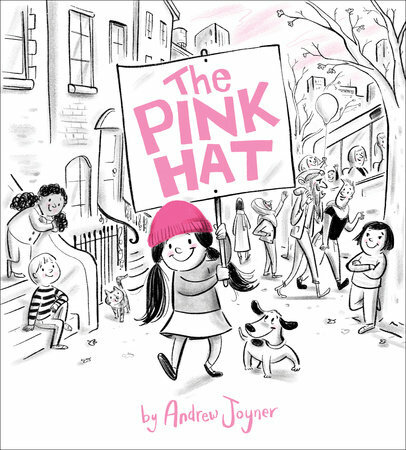 Summary: Here is a clever story that follows the journey of a pink hat that is swiped out of a knitting basket by a pesky kitten, blown into a tree by a strong wind, and used as a cozy blanket for a new baby, then finally makes its way onto the head of a young girl marching for women’s equality. 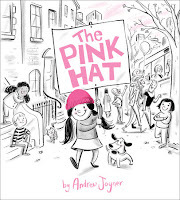 THE PINK HAT by Andrew Joyner is a cute book that also has a powerful message. This picture book follows the travels of a pink hat that was stolen out of a knitting basket by a mischievous kitten. The hat has quite the adventure as it travels through the wind, lands with a baby, gets stolen for a bird, played with by a dog, and finally finds a home with a little girl. The little girl cleans up the hat and wears it everywhere only to end up wearing it with many, many others! I thought THE PINK HAT was a clever way to introduce the idea of women's equality to young girls. The book has very basic text, along with very cute black and white (and pink!) illustrations, that is appropriate for even the youngest of toddlers. However, the true message in this book is geared towards a slightly older crowd. THE PINK HAT demonstrates the importance and power of joining together for an important cause. THE PINK HAT is an important book that mothers (and fathers) can use to introduce the concepts of gender equality and strength in numbers. Both of those books look really cute but the message of The Pink Hat sounds outstanding to me. Wow, such great books. I would have loved the unicorn book as a child. I collected unicorns. The Pink Hat has such a great message for girls! It reminds me a bit of The Mitten story. It's very cool that there are so many kids books that teach without being pedantic.